Waste no pity on Offenbach because he has only one opera in the repertoire (and for dying before he could see it). This one’s a doozy. TALES OF HOFFMAN. Opera by Jacques Offenbach, libretto by Jules Barbier. Cast: John Kaneklides (Hoffmann), Kathleen Shelton (The Muse / Nicklausse), Kelly Curtin (Olympia), Lara Lynn McGill (Antonia), Tara Curtis (Antonia’s Mother), Susan Hellman Spatafora (Guilietta). Stage Director: Karl W. Hesser; Dance choreographyer: Daryl Gray; Costume designer: Glenn Breed; Conductor and executive director: Mark Sforzini. Produced by St. Petersburg Opera. 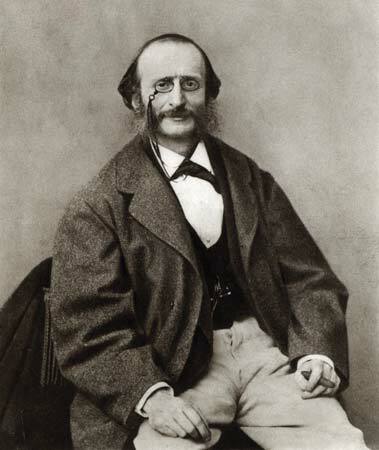 Jacques Offenbach composed over 100 operas. But waste no pity on him because he has only one in the repertoire (and for dying before he could see it). Tales of Hoffman, based on three short stories by Ernst Theodor Amadeus Hoffmann, is immortal, right up there with (many of) Giuseppe Verdi’s operas. Any company that performs it must not only be faithful to its strikingly original music, but also tackle its adventurous staging. I’m happy to say the St. Petersburg Opera delivered the goods on both. And boy did it ever. The singing was energetic, bold, and heartfelt. The well-timed movement of the singers and dancers was as startling as lightning striking twenty feet away. Gone are the days when big-name singers like Leontyne Price, Birgit Nilsson, and Luciano Pavarotti just stood in place and sang. Right from the prologue, the audience knew it was in for a zippy ride through modern operatic production. As Hoffman, tenor John Kaneklides delivered the famous “Il était une fois à la cour d’Eisenach” (the Kleinzach aria) with crackly energy. He moved agilely across the stage and pantomimed the hunchback’s head going “crik crack.” Great fun and this was just the beginning. The first act presented the mechanical doll Olympia that Hoffman mistakenly fell in love with. Her famous aria “Les oiseaux dans la charmille” was a wonder of kinetics. Soprano Kelly Curtin fascinated with robotic movements that contrasted with her nimble cadenzas and precise coloratura. Add to that her unflawed stratospheric runs and roulades. “How can she do both at once?” my wife asked. I could only shrug. For continuity of theme, Offenbach wanted one soprano to sing all four of Hoffmann’s love interests. But because this production wisely declined, it benefitted from the individuated movements of all three actresses – the quirky-jerky Olympia, the callow and tentative Antonia, and the flirtatious Guilietta. It was a brilliant stroke to feature two dancers, Vanessa Russo and Dominiq Luckie, during the musical interludes. The choreography of Daryl Gray was inventive and varied. Tales of Hoffman gives us a fantastical take on the trope of the tortured artist, and also addresses contemporary issues of women’s roles. Antonia’s father, and to some degree Hoffman, chide her “You can’t be a singer and raise a family.” But the devil/Dr. Miracle lures her into disobedient singing and it ultimately kills her. And then there’s the matter of men’s silly sexual obsessions, like falling in love from afar (with a mechanical doll/android) and allowing “bad women” (the courtesan Guilietta) to steal their reflections/souls. It makes short work of those follies. The powerful trio “Cher enfant” between Antonia, her mother, and Dr. Miracle. Bass-baritone William Roberts, soprano Lara Lynn McGill, and mezzo Tara Curtis gave it an affecting and exciting interpretation. So well blended were these three voice types that nobody fidgeted. William Roberts’ rendition of the famous Dapertutto aria, “Scintille, diamant.” Offenbach wisely snatched it from his now obscure operetta, Le voyage dans la lune. Roberts’ deft vibrato revealed rich tones in this piece about a diamond that scintillates. Hoffman’s ardent refrain to Guilietta, “Ô Dieu! de quelle ivresse.” Foolish infatuation sung so eloquently you almost overlook the silliness. Sometimes the St. Petersburg Opera produces DVDs of their past performances. If they do this one, get it. Why? This Hoffmann wasn’t just musically gratifying and vividly theatrical, it was haunting and profound, sparkling with depth and complexity. The famous “Belle nuit, ô nuit d’amour” (a.k.a. “Barcarolle”) used to make my mother weep. (And this was just the instrumental version. When I played the vocal version, she wept even more.) Alluringly androgynous, Kathleen Shelton was saucy and sarcastic in the role of Nicklausse – the personification of Hoffmann’s artistic inspiration. And she performed this most memorable of arias with Susan Hellman Spatafora as Guilietta. Both sung with excellent restraint that bordered on the understated. My mother would have loved it. This is a wonderful review. While acknowledging the strong contribution and merits of many performers in “Hoffman” as well as the choreography and dance in this production, this reviewer rightfully should have acknowledged the person responsible for this, the choreographer! Thanks for your suggestion. See the review.